The team details its research in “Energy-filtered cold electron transport at room temperature,” which is published in Nature Communications on Wednesday, Sept. 10. “We are the first to effectively cool electrons at room temperature. Researchers have done electron cooling before, but only when the entire device is immersed into an extremely cold cooling bath,” said Seong Jin Koh, an associate professor at UT Arlington in the Materials Science & Engineering Department, who has led the research. “Obtaining cold electrons at room temperature has enormous technical benefits. For example, the requirement of using liquid helium or liquid nitrogen for cooling electrons in various electron systems can be lifted.” Electrons are thermally excited even at room temperature, which is a natural phenomenon. If that electron excitation could be suppressed, then the temperature of those electrons could be effectively lowered without external cooling, Koh said. 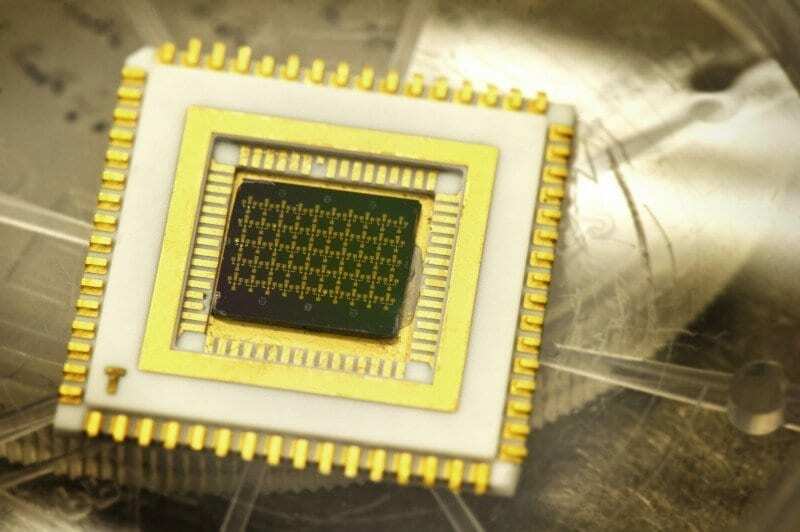 The team used a nanoscale structure – which consists of a sequential array of a source electrode, a quantum well, a tunneling barrier, a quantum dot, another tunneling barrier, and a drain electrode – to suppress electron excitation and to make electrons cold. Cold electrons promise a new type of transistor that can operate at extremely low-energy consumption. “Implementing our findings to fabricating energy-efficient transistors is currently under way,” Koh added. Khosrow Behbehani, dean of the UT Arlington College of Engineering, said this research is representative of the University’s role in fostering innovations that benefit the society, such as creating energy-efficient green technologies for current and future generations. “Dr. Koh and his research team are developing real-world solutions to a critical global challenge of utilizing the energy efficiently and developing energy-efficient electronic technology that will benefit us all every day,” Behbehani said. “We applaud Dr. Koh for the results of this research and look forward to future innovations he will lead.” Usha Varshney, program director in the National Science Foundation’s Directorate for Engineering, which funded the research, said the research findings could be vast. September 12, 2014 - Cryogenic on-chip quantum electron cooling leads towards computers that consume 10x less power ExtremeTechResearchers at UT Arlington have created the first electronic device that can cool electrons to -228 degrees Celsius (-375F), without any kind of external cooling. March 23, 2012 - Focus: Cooling with a Warm Glow PhysicsIncoherent light from the sun or from an LED could cool a small object, according to two theory papers.